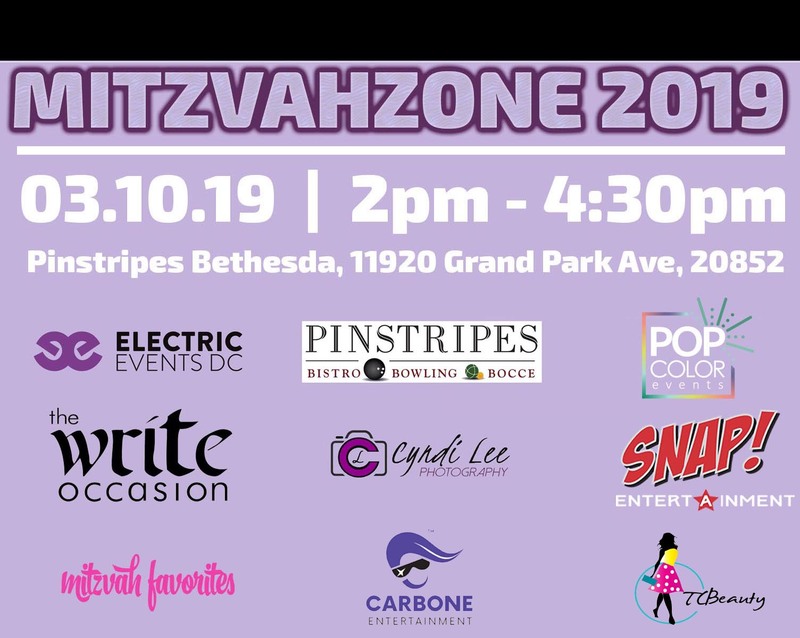 It’s an interactive experience: MitzvahZone’s unique “party” approach to a Bar & Bat Mitzvah showcase allows you to witness your entertainment first hand…something a sales pitch at a booth just can’t duplicate. Come meet our talented team, learn the newest dance moves, play exciting games, see dazzling lighting/video setups, and check out one of the hottest digital-photo trends around – all in one convenient place. But that’s just the beginning. We have an on-site event planner to answer any of your questions; we have a professional photographer snapping live-action photos that you’ll get to see; we’ve got the area’s most exciting DJ troupe entertaining guests of all ages; and we even have decorations you can see in person, with an experienced decorator who can help design that perfect party. Not to mention free food, fabulous door prizes donated by vendors, and lots of take-home goodies. Sure beats a day in front of the TV, doesn’t it? We are at sold out for MitzvahZone. We will be accepting a limited number of walk-ins when doors open at 2pm. Electric Events DC prides ourselves on providing clients with a unique, customized experience that makes planning one-in-a-lifetime events fun and stress-free. WE SHARE THE PASSION TO EXECUTE Unique, HIGH-ENERGY CELEBRATIONS WHERE EVERYONE IS INCLUDED. We aren’t performers; we’re entertainers. That discrepancy is crucial a truly unique celebration. Each MC, DJ and dancer goes through our training program developed over the last 15 years and thousands of events to ensure the highest level of entertainment. We make it a point to get your guests actively involved in the party, not just standing there watching a canned performance. EMAILS ARE RETURNED PROMPTLY. PHONE CALLS ARE ANSWERED BY AN OWNER. MEETINGS HAPPEN IN PERSON. There are no secretaries or agents to deal with; no list of 50 different acts from which you need to choose. Just a solid handful of passionate, energetic people that love to bring the best out of your guests. This means that your event gets personal attention by someone with a vested interest in its success. It is the attention to detail and inherent passion which gives Electric Events DC the winning edge over competitors. WE’RE EXCITED TO SHOW YOU WHY WE BELIEVE OUR APPROACH LEADS TO A DIFFERENT TYPE OF PARTY. One you’ll never want to end, but can’t wait to get started. From innovative lighting designs and lounge furniture, down-to-earth entertainers and warm customer service, there is no reason to look anywhere else for your event entertainment, rental and production needs.….unless exceptional isn’t your thing, of course.